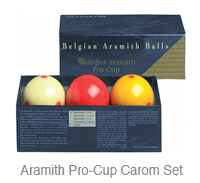 These pool balls sets are produced to the most exacting tolerances and standards. 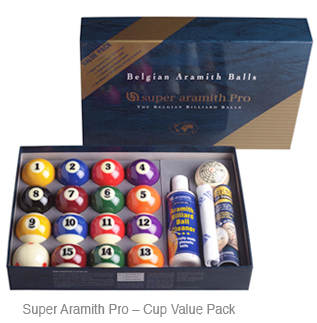 Each pool ball in this set is, on top of the multiple regular controls, individually calipered to insure maximum consistency from ball to ball in order to constitute a homogeneous matched set of pool balls for true excellence at play. 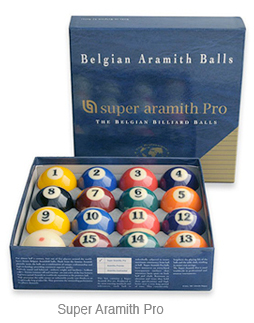 The phenolic resins used in this top quality set of pool balls even further maximize the ball and cloth life. The pool balls transparent vitrified surface is through-hardened, allowing the pool balls to hold their specifications over an unusually long period of time. This is the top of the line set from Aramith in Belgium. Made of the patented phenolic material that the Saluc company developed almost 50 years ago. This set has the 6 red dots on the white and yellow balls which allow you to see every spin of the ball and help improve your understanding of the game.